Banks understand loans, but HDFC Credila understands students and their needs! Ability to get web-based access to the loan account with web enabled transaction processing inclusive of electronic payments, etc. HDFC Credila is a specialized lender for Education Loans. HDFC Credila has invested time and resources to set up appropriate systems, processes and know-how related to the education industry. HDFC Credila has numerous databases on education sector. HDFC Credila's credit scoring model for the approvals of loans is designed specifically for education loans. HDFC Credila, therefore, understands problems, challenges and issues faced by the students and their parents. HDFC Credila's objective is to work closely with students and parents to try to identify the appropriate education loan programs for them. To get admission to the US Universities & to get I-20 for US visa, "Availability of Liquid Funds" to complete the course needs to be demonstrated. 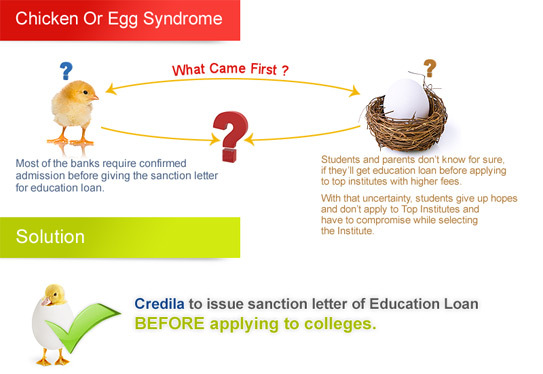 HDFC Credila's "Education Loan Sanction Letter" before admission can help you show the availability of liquid funds. All parents dreams about the best possible higher education for their children. Funding the rising cost of education is becoming increasingly difficult. We provide education loan to fund up to 100% of cost of education. HDFC Credila representative can visit you, understand your funding needs and get the process of education loan completed. Have one more option for education loan! Save time and energy. Call us for a door-step service about your funding needs.